The Next Small Cap presents this information for the use of readers in their decision to engage with this product. Please be aware that this is a very high-risk product. We stress that this article should only be used as one part of this decision making process. You need to fully inform yourself of all factors and information relating to this product before engaging with it. 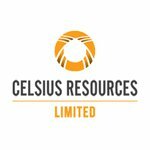 Celsius Resources (ASX: CLA) continues to progress exploration at its Opuwo Cobalt Project in Namibia as it works towards locking in a JORC Mineral Resource. The potential of the project to host large scale, sediment hosted copper-cobalt mineralisation with approximately 30km strike length of prospective mineralized horizon has been established. CLA has now taken a 95% interest in the highly prospective project, up from its earlier 30% holding. And in what is seen as an endorsement of the project, CLA’s joint venture partner, Gecko Namibia, has established itself as CLA’s largest shareholder. Gecko has also agreed to sell a 95% interest in three surrounding licences in the Opuwo region, covering approximately 782km 2 , with the highly experienced Managing Director of the Gecko Group, Mr. Pine van Wyk, joining the CLA board. Pine van Wyk has extensive experience in the mining industry, particularly in developing and operating mines in Namibia. He has had a long, established career, joining Paladin Energy Ltd in 2005 at their Langer Heinrich Uranium project as Operations Manager, taking the project from feasibility to full production. His experience will be invaluable to CLA as it looks to the veteran for a similar impact. Keep in mind that this is an early stage of CLA’s development, so if considering this stock for your portfolio you should take all public information into account and seek professional financial advice. When we last updated you on CLA back in April, the junior explorer had just reported that it had intersected better than expected cobalt-copper-zinc mineralisation at its Namibian operations. The most recent round of drilling at the project returned some impressive results, including a new mineralised zone. 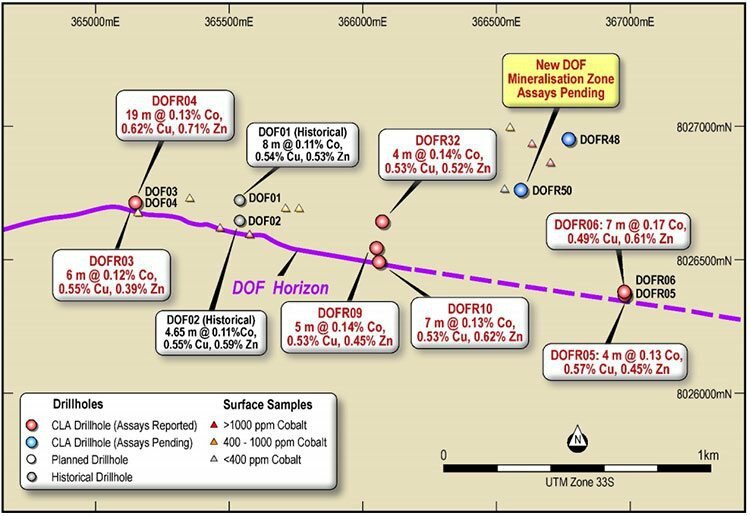 The results are consistent with previous batches of results, showing potential for higher grade zones within the extensive mineralised system. Mineralisation was intersected in wide spaced drilling over 11 kilometres of strike, including a 1.9 kilometre zone. This strong cobalt-copper-zinc mineralisation was intersected close to the two historical holes drilled in 2015. The interceptions included seven metres at 1,321 ppm cobalt, 1.11% copper and 1.10% zinc and two metres at 3,075 ppm cobalt, 0.41% copper and 1.13% zinc. To gain exposure to the project CLA was looking to acquire the company via staged exploration expenditure. The company is cashed up and well prepared for the venture, having earlier raised capital to fund its drilling efforts. A total of 50 drill holes have now been completed at CLA’s Opuwo Cobalt Project in Namibia, demonstrating mineralisation over a strike length of more than 15 kilometres. A significant recent development from the latest round of drilling was the discovery of additional Dolomite Ore Formation (DOF) 350 metres north of existing known and mapped mineralisation that has been systematically tested by the ongoing drill programme. Assays from these drill holes are pending and should be made available in coming weeks. 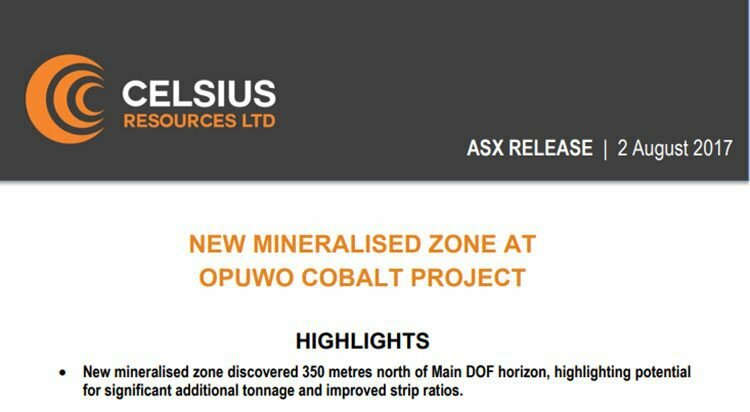 ASX-listed cobalt developer Celsius Resources’ (ASX: CLA) is building on previous exploration at the Opuwo Cobalt Project as it progresses towards its goal of obtaining a JORC Mineral Resource. 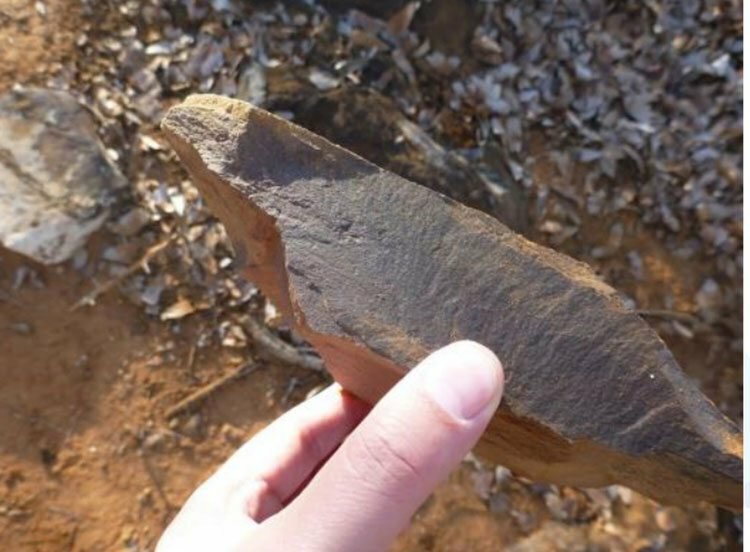 You can read about CLA’s earlier exploits and how the highly experienced Managing Director Brendan Borg was instrumental in initiating the drilling program in the articles: 11km Cobalt Strike Confirmed by CLA: More Drilling to Come and Cobalt Drilling in Coming Weeks: ASX Explorer to Test 20km Strike Length . Earlier exploration uncovered and identified a number of targets, which CLA is using to fast track its own development. CLA owns 100% of Opuwo Cobalt Pty Ltd. Following the completion of the agreement with Gecko Namibia for A$1.25 million prior to the completion of the Bankable Feasibility Study, CLA will then hold a 95% interest in EPL 4346 of the Opuwo Cobalt Project. Gecko has also agreed to sell to CLA a 95% interest in three surrounding licences in the Opuwo region, covering approximately 782km 2 , taking the contiguous landholding of the expanded Project to approximately 1,470km 2 . The remaining 5% in all project licences will be retained by Amor Investments (Amor), a local Namibian Company owned by historically disadvantaged Namibians. As part of the deal, Gecko has agreed to a voluntary escrow lock on the CLA shares it receives as to 50% for six months from completion and 50% for 12 months from completion. Completion of the acquisition is also subject to Gecko making an application for the approval by the Minister of the transfer of the Additional EPL’s by Kunene Resources to Gecko Cobalt Mining Pty Ltd. The expanded landholding now places CLA in a dominant position in a region that has the potential to be a significant cobalt and copper district. The new licences also extend the prospective cobalt and copper stratigraphic horizon to over 100km. Historical sampling and laboratory assays over this additional strike zone, consisting of just 15 samples, yielded results of up to 8.3% copper and 0.32% cobalt , illustrating the high potential to identify further cobalt and copper mineralisation on the new licences. The expansion of the land position allows CLA to explore for possible source zones and additional cobalt-copper mineralisation to the north and south of the known DOF mineralisation. To this end, an airborne electromagnetic survey is planned for Q4, 2017, which will cover the expanded licence to identify possible accumulations of massive sulphides and potential extensions to the known Dolomite Ore Formation (DOF) cobalt-copper mineralisation. The new licences have significant potential for other commodities as well including zinc-lead-vanadium (Otuziru Prospect), copper-gold (Chirumbu Prospect), chromium-vanadium (Jimi Prospect) and lead-zinc-silver (NOTZ Prospect). In the first week of August, CLA discovered additional DOF in a drill hole 350 metres north of the known and mapped mineralisation with the prospect undergoing systematic testing through the current drill program. Further drilling will be required to determine if this is a parallel occurrence or a result of folding of the known DOF unit. In addition to the new mineralised zone, CLA announced drilling results that continued to confirm the potential for higher grade zones within the extensive mineralised system. Assays are still pending for a further nine holes that have been completed. These drilling results have provided a degree of confidence regarding the project. They are consistent with previous batches of results received, and importantly continue to show potential for higher grade zones within the extensive mineralised system. Mineralisation extends to surface or near surface along the entire strike length investigated to date, and has now been demonstrated to extend to a vertical depth of at least 150 metres. 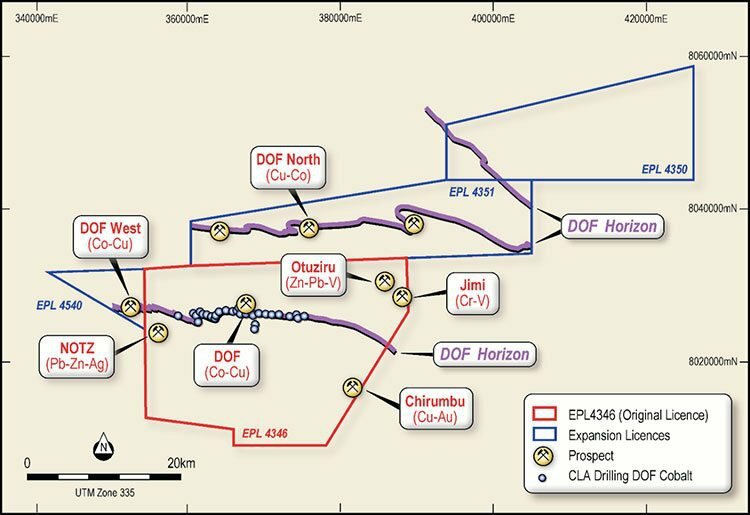 This initial phase of reverse circulation drilling is designed to test a 20 kilometre strike length (part of a 30 kilometre strike) of the cobalt-copper mineralised DOF horizon, and is expected to be completed within coming weeks. But now that a new mineralised zone has been discovered, an additional two holes are being considered. Diamond drilling is continuing, providing samples for first pass metallurgical testing. Three holes have been completed, with another five holes remaining in the planned program. The diamond drilling program is expected to be completed in August, just days away, with sample test results, once again a potential share price catalyst. 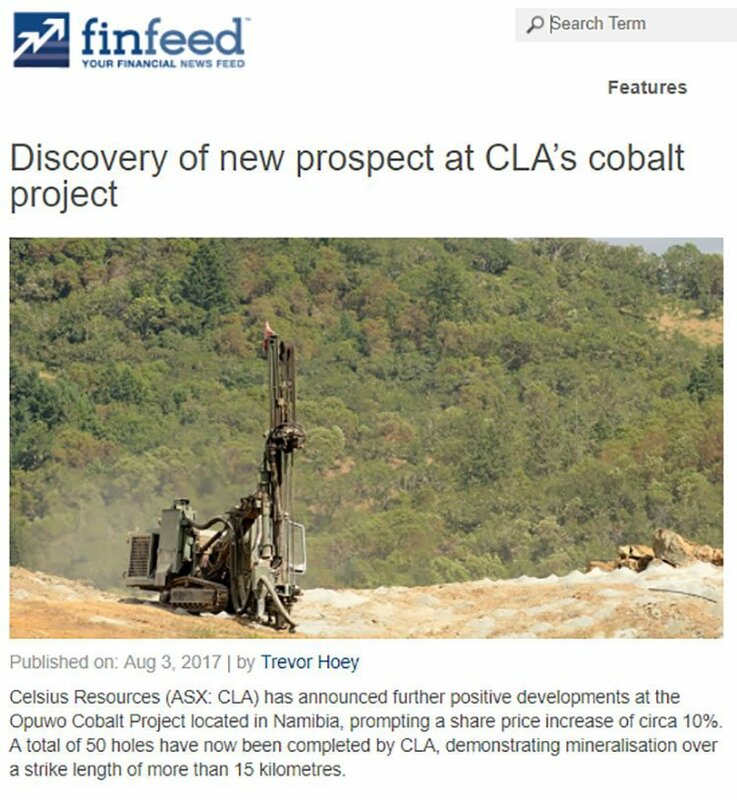 CLA’s share price has risen by 150% over the past 12 months, on the back of increased investor attention from its decision to progress the Opuwo Cobalt Project and subsequent exploration progress. Yet, according to research by Aesir Capital , that run still has some way to go before the share price matches their valuation. The analysts at Aesir Capital have a ‘Speculative Buy’ recommendation on CLA and a 12-month price target of 11 cents per share. Even after the impressive share price rise over the past year, this target price is still 185% above the current share price. Aesir have calculated that using even just a conservative production estimate, we could see CLA’s capped at more than $100 million. That’s well up from the current market cap of less than $20 million. broker notes that the Opuwo Cobalt Project looks attractive when compared to other emerging cobalt projects when considering issues facing its peers such as underlying geopolitical risks, lack of access to key infrastructure and the seemingly inferior grades. Aesir acknowledged that CLA need to complete its exploration program and define a JORC resource. Yet it made some positive early stage observations in explaining that a US$166/t basket price CLA is 1.4 times higher value per tonne than CleanTeQ (ASX: CLQ). Assuming that CLA could come up with an 80Mt resource, it could, in theory, justify a roughly comparable market cap of $430 million. That‘s a huge leap from the company’s current $19 million market cap. Granted, that could be still some time away. So Aesir crunched some numbers on a smaller scale production model, finding that even at 20Mt, which seems achievable given the strike length and the fact that 11 kilometres is already proven to be mineralised. That would equate to a $107 million market cap, or a 500%+ upside. If management can continue to prove consistent grades across the entire strike of more than 20 kilometres, Aesir is confident that CLA will be enough to develop Opuwo economically, particularly if it can define higher grade zones. Aesir is impressed with the DRC-like (Democratic Republic of the Congo) nature of CLA’s deposit, which comes without any of the associated political or sovereign risks. The following article explains the pitfalls of sourcing cobalt from the DRC and hints at why end users, including multinational manufacturers, are seeking alternate cobalt sources. The DRC has close to half of the world’s cobalt reserves. 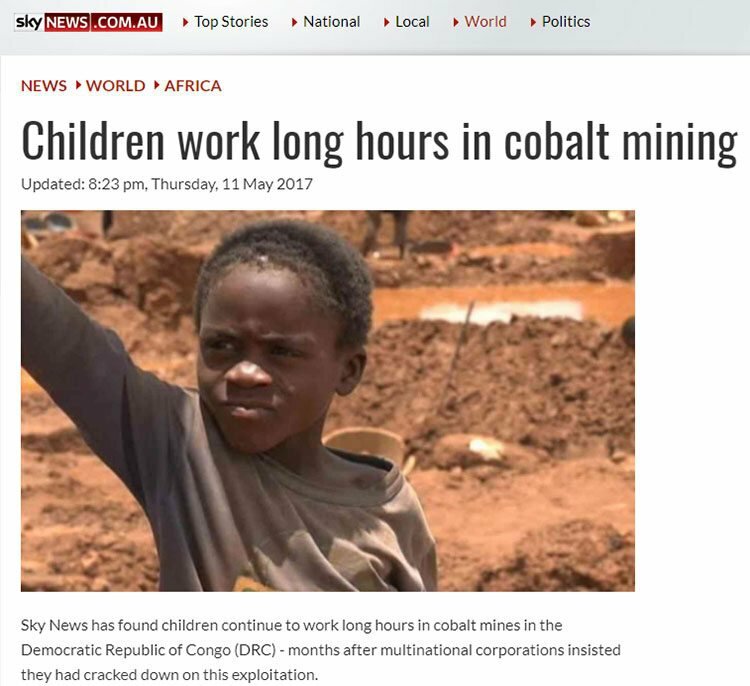 For that reason cobalt resources and production are concentrated in the DRC, which currently accounts for more than half of the world’s production. The industrial importance of cobalt and the concentrated supply, has led to cobalt being classed as a strategic mineral by the US Geological Survey (USGS) and as a critical raw material by the EU. Finding alternate sources, outside if the DRC, is crucial to meet rising demand. With shares trading at such a large discount to the analyst’s target price, now could be a time to take a closer look at CLA, especially as it has just expanded its landholding and potential to identify further cobalt and copper mineralisation. However, CLA does remain a speculative stock and investors should seek professional financial advice if considering this stock for their portfolio. Add to the mix a seasoned veteran of Namibian mining and CLA could have a powerful combination of expertise and prospectivity. And with the receipt of upcoming assays, it’s certainly possible that this could be another share price catalyst. We will know more shortly as the company conducts follow up drilling in the area to enhance its understanding of the broader project area.